Disabling Replication in OpenDJ 2.4. Enabling replication between multiple instances of the OpenDJ LDAP directory server is pretty simple and straightforward. You can check for yourself in the Replication chapter of the Administration Guide. But fully disabling replication can be tricky with OpenDJ 2.4, mostly because of a known issue with the dsreplication disable –disableAll command : OPENDJ-249 : Doing dsreplication disable –disableAll is throwing a javax.naming.CommunicationException when removing contents of “cn=admin data”. Note, all these steps should be done using ldapmodify, or an LDAP browser such as OpenDJ Control-Panel’s Manage Entry or Apache Directory Studio. Months goes by, but the pace of releases remains. Today, I’m happy to announce that a new revision of OpenDJ, the open source LDAP directory server in Java has just been released. OpenDJ 2.4.4 is an update release of the OpenDJ project and improves reliability by resolving issues found around the External Change Log, Replication, Password Policy and GSSAPI. It also resolves a memory leak that occurred with specific LDAP extended operations, such as the Password Modify Extended Operation. 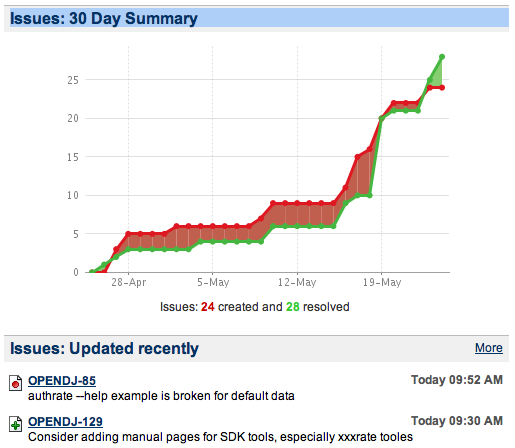 The full details about the release have been posted in the OpenDJ 2.4.4 Release Notes. The release is built out of revision 7357 of the b2.4 branch of the code repository. The SVR4 package for Solaris users. The draft documentation for OpenDJ, and more specifically the Administration Guide, has been updated on the OpenDJ project site, still on the track for an accurate, reviewed version for OpenDJ 2.5. Another revision of OpenDJ has just been released. OpenDJ 2.4.3 is an update release of the OpenDJ project and resolves several issues found around the External Change Log and the bundled database version. The version is built out of revision 7007 of the b2.4 branch of the code repository. The full details about the release have been posted in the OpenDJ 2.4.3 Release Notes. In addition, some draft documentation for OpenDJ, and more specifically the Administration Guide, are now published (and regularly updated) on the OpenDJ project site. I’ve already mentioned that Mark Craig has joined ForgeRock and started to blog about OpenDJ. I’m sure there are more to come. If you’re not following Mark’s blog feed yet, you should ! What’s up ? Doc ! It’s been a few very busy weeks and I haven’t found the time to properly introduce a new member of the ForgeRock Grenoble Engineering Center : Mark Craig. After Matthew who joined us as Architect for OpenDJ, Gary who is covering Quality Assurance for our products, Mark Craig has joined us on the 1st day of April to cover a very important part of any real Product : the documentation. Mark comes from Sun Microsystems (and a few months at Oracle) where he has played different roles, from technical writer, to manager for all technical writers in the Identity Management BU, to managing the Directory Integration Team responsible for customer interactions and audits, performance benchmarks and assisting POCs. At ForgeRock, Mark goes back to his roots and things he enjoys and excels in: writing. You can read Mark’s prose on his new blog (Margin Notes 2.0), OpenDJ blog or already on ForgeRock documentation wiki.